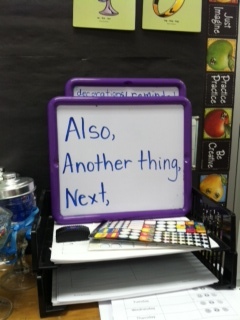 I’m always trying to find ways to motivate my students to read. I read books to them, try to give intriguing book introductions, express my enthusiasm, and even act a little crazy from time to time, all in the hopes that they will want to pick up a book and read. Sometimes, I don’t need to work so hard. If we read a book together and the students love the characters, all I have to do is find another book with those same characters and the excitement to dive in is already there. Earlier in the year, my second grade students read a Pioneer Valley book about two little white dogs named Bella and Rosie. Generally, Rosie follows the rules and Bella breaks them. There are many Bella and Rosie stories in this series, so there are many opportunities to learn about their personalities through actions, illustrations, and dialogue from book to book. Recently, my second graders read their first chapter book about Bella and Rosie and were able to compare the actions and adventures in the story with the story they read earlier in the year. This lends itself well to the Reading:Literature Standard 1.9, “compare and contrast the adventures and experiences of characters in stories”. Although this is a first grade standard, my second grade students are getting good practice doing that in preparation for the end of Grade 2 standard (RL 2.9), which is to “compare and contrast two or more versions of the same story by different authors or from different cultures”. After reading, we discussed the events in the text and the kids determined that between the two dogs, Bella was definitely the “bad” one. I posed the question “How do you know Bella is a bad dog?” and I asked the students to write their answers using evidence from both texts. Because the kids love these characters, they were more than happy to search for evidence from both books to prove Bella is bad. 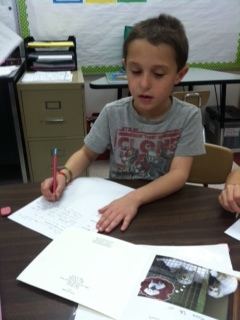 We also talked about using “bridge” words to make their writing sound better than just writing a list. All this practice will make our end of year expectations easy to meet and best of all, it feels like fun because we are starting with characters we know and love. Alex searches both texts for evidence. 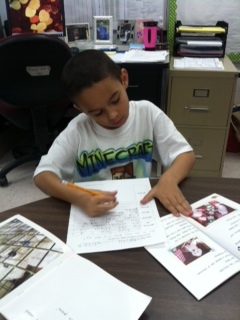 John rereads his writing to be sure it makes sense. 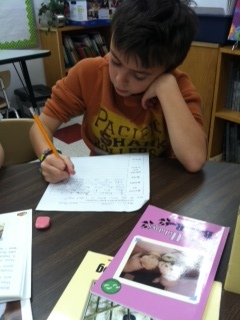 Connor is focused on his writing. We agreed these “bridge” words make our writing sound better.